One of the keys to our 2017 experimental renovation of Francis Field was water, which was largely lacking. We were required to begin the project on June 19, 2017, at the beginning of summer—one of the worst times of the year to plant grass. To be able to begin then, and have any chance of the grass seed germinating and surviving the hot summer months, we devised a temporary, experimental irrigation system. Since our initial source of water was a single spigot on the outside of Francis Swimming pool, our landscaping contractor (who had worked in Honduras with the Peace Corps) suggested a series of sprinklers on tripods. One of these in early operation is shown in the photograph at right, taken on June 26, 2017. Since there was not enough water pressure to run multiple sprinklers, we used battery-powered timers to fire the sprinklers one at a time. This turned out to work very well, although the system had to be checked and maintained almost daily. 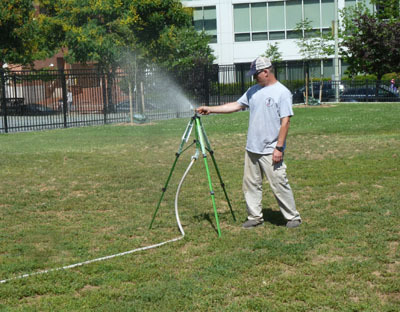 Francis Field once had a costly irrigation system, installed by George Washington University (GWU) in 1990, when it entered into a questionable legal agreement with the administration of DC Mayor Marion Barry. That agreement gave GWU exclusive use of the public field to the private university for its baseball and soccer teams.1 Remnants of that system, which failed after about three years of use, remain on the field. GWU's teams moved to other locations, and the field soon became a largely bare-dirt field. See the "Neglect" article on this website for photographs of this "bare-dirt" condition over an 18-year period from 1999 up to April 2017. 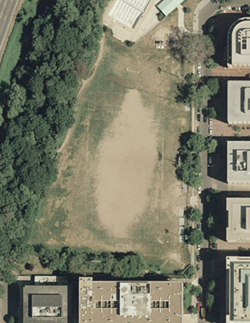 Shown below is a 1999 satellite photograph that shows how GWU's sodded field deteriorated once the irrigation system ceased to be maintained. It is that condition that the Friends of Francis Field (FFF) have been trying to correct since 2007, during three mayoral administrations. 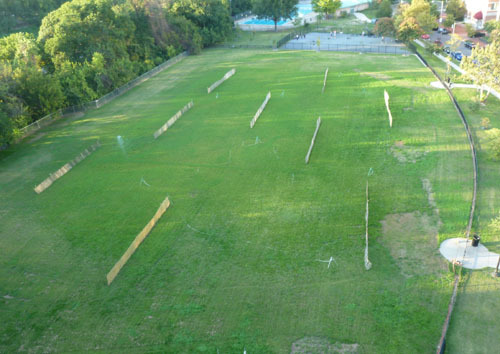 FFF reached an agreement with the Department of Parks and Recreation (DPR) in March 2017, during the administration of Mayor Miriam Bowser, to improve the field with private funds.3 Planting trees and grass were two of the three parts. Studying the irrigation problems and solutions was the third part, which is the subject of this article. In recent years, the emergence of "green infrastructure" and "low-impact development" has shown the problems created by storm water run-off on urban roofs, lawns, and impervious surfaces such as streets and parking lots. Storm water picks up traces of motor oil, gasoline, herbicides, rubber tire particles and other pollutants that should not be returned to water sources such as rivers and lakes. The current science favors treating run-off in place, with so-called "green roofs," "rain gardens," "bio-swales" and other natural biological features that allow storm water to naturally purify itself as it returns to the water table below ground. Runoff from Francis Field currently reaches city sewers on 25th Street on the east, and Rock Creek on the west. It would provide an excellent natural environment to treat in place storm water from the field itself, and surrounding streets and buildings. FFF also believes that the best irrigation system would be to store and re-use natural storm water. Such systems are in place elsewhere, including a very large system on the National Mall here in Washington, DC. Two photos of that system are shown below. On the left is one section of large system of cisterns that have been constructed under the mall to collect storm water. The photo on the right shows this water being sprinkled to irrigate the grass on the heavily used Mall. Such a system for Francis Field is years away, and will take extensive consultation with engineers, as well as the cooperation of the District of Columbia Department of Transportation, and the Department of Energy and Environment. Our challenge during 2017 was to get running water of any kind restored to Francis Field. 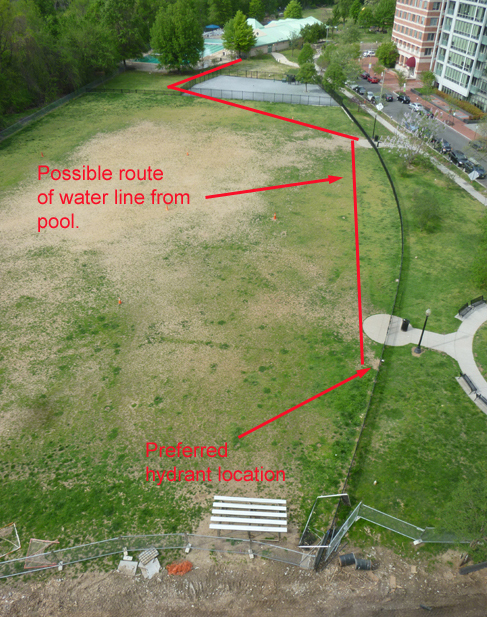 During our plan to plant 43 trees on the field, which required the planted trees to be watered, we discovered that the locked hydrant at the south of the field was not operative, and that even the drinking fountain installed with private funds in 2010 had been disconnected during the construction of the Francis Dog Park in the fall of 2015. We resorted to watering the trees with private water from the parking level of the building at 2501 M Street. For the hot-weather grass planting we were required to do in June, we ran sprinklers from a single spigot on the exterior of the Francis Swimming Pool, as described above. 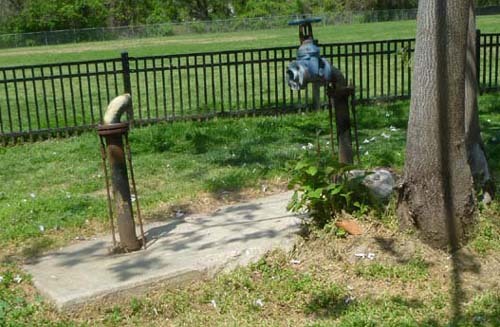 Meanwhile we worked to convince the DC Department of General Services (DGS) that the drinking fountain as well as new field hydrants could be activated without digging up concrete on 25th Street. Shown at left is the diagram we submitted, proposing new water lines from the swimming pool instead. DGS approved our plan, as did DC Water. Construction of the water lines took place during the first few days of August, and the plumbing connections were made inside the pool house of Francis Swimming Pool, which, of course, has an ample supply of city water. By August 3, the drinking fountain was hooked up again, and two field hydrants were installed, providing better water pressure for our temporary sprinkler system. Within several days we were able to disconnect our makeshift irrigation system from the spigot on the swimming pool. As shown in the photo at right, our makeshift system was effective in making the grass (and weeds) grow on the field, eliminating storm-water run-off, and providing a green and natural playing surface rather than the bare dirt that had existed on the field for decades. Irrigating the field with the temporary system this way will not be possible much longer, as the system will have to be removed for the winter. It will not be replaced when the field is re-opened to play on March 19, 2018. FFF remains committed to a stored rainwater system for irrigating Francis Field, and we will be continuing our study. 01. Jessica Porter, "GWU Repairs City-Owned Field in Unique Agreement," Washington Post, November 8, 1990. 02. George Washington University, "Francis Field is New Home for Colonials Soccer and Baseball Teams," (press release), October 10, 1990.